Here's a great side dish that covers the vegetable and the starch. Perfect served beside something grilled. 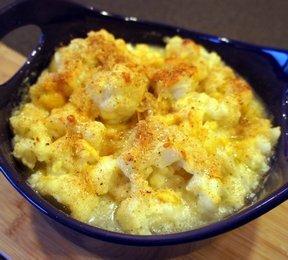 Be sure to serve it up with a spoon so you can get all the cheesy goodness from the bottom of the baking dish. Cook cauliflower in small amount of salted water, approximately 12-15 minutes until tender; drain. 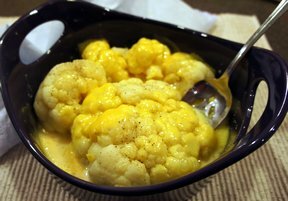 Place cauliflower in a shallow ungreased baking dish. 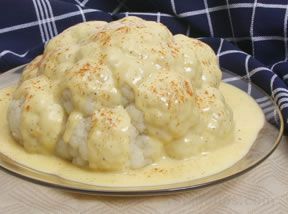 Combine mayonnaise and mustard; spread over cauliflower. Bake at 375° for 5 minutes. Top with cheese and bake 5 more minutes. "I eat a low-carb diet and all these ingredients are low carb friendly. To be honest, just 2 tsp of mustard leaves the mayo bland and living in South Texas, we like a little more zip to our meals. I recommend upping the mustard to 2 Tbs, salt & pepper the cauliflower before spreading with mayo, and add 1/2 tsp of garlic powder to the mayo for some flavor. I used shredded natural cheese vs. Velveeta since there's so many carb in processed "cheese". I will make this again." "Love this! 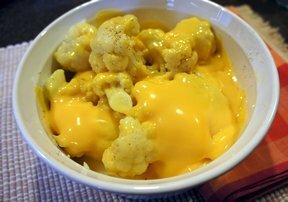 Cheesy cauliflower has to be made with Velveeta though. The mayo mixture was a little scary but tasted great."